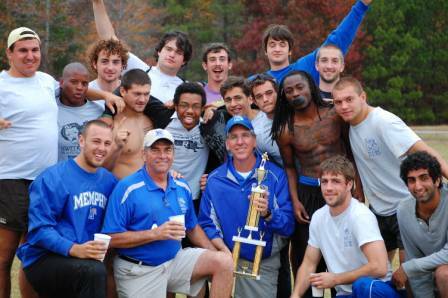 The Memphis Tigers won first place in the 2012 Ruggerfest by winning three matches in a row over the weekend. The Tigers started with Oklahoma State University Saturday at noon. OSU had beaten the Bomber U-20 team earlier that day and were hoping to extend their streak. They were bigger in their pack but slower. We have finally learned to run around the big boys, playing our game and not theirs. Jonathan Bauer took his first points as a Tiger scoring a try late in the first half. Other tries were scored by Josiah Shipley, Tezman Mosley, Jay MacDonnchadh and Phil Elliott (x2). In all, six tries were scored by the Tigers with 4 converted by Phil. OSU scored some in the second half while our Killer “B”s got some playing time. Final score Tigers win 38-24. The forwards used superior technique on larger players to get past them. It was a pleasure watching Ryan Phillips and Chris Cobb flip large players out of a ruck giving us a chance at the ball. We did a much better job throughout the weekend with our containment defense, a system we have been working on through the season. The combination of attacking backs and covering forwards seems to be paying off. The kicking game needs some work but we showed improvement. I didn’t see a great counter in the match, but we did catch the ball and run toward support. Next up was Pittsburgh State (from Kansas). The game started with a penalty try at the 2 minute mark. Phil kicked ahead into goal and the defense just grabbed Phil to prevent the try. We confused them early and while they were confused, we poured on the gas. Quick scores were made in the 5th, 12th, 14th and 23rd minutes of first half, three by phil and one by Brandon. It looked like KSU had a good up and out defense but they forgot to play Phil. He recognized this along with their failure to have a fullback in place. Phil made them pay. Phil slotted a penalty in the second half. Joshua Campbell and Josiah Shipley took trys in the second half and Kasra converted. KSU picked up some points while our seconds were in the match. Tigers finished the match 50-27. Team dinner was at the Golden Corral restaurant. The dinner cost $400, but the lads ate $1000 in food, easily. It was a blast watching some of these lads put away the groceries. Sunday team meeting at 9:00 set the expectations for the day. We knew that we had a shot. We were healthy, rested, fed. The tension was palpable. With perfect timing, Mimms cracked up the boys. After a hearty laugh, we set our goal for the day and took off for the field. 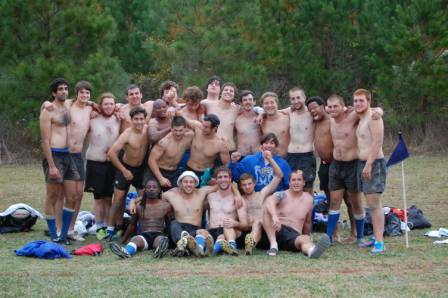 The Bomber Academy (BA) is made up of U-20 athletes that the St. Louis Bomber Rugby Club is developing. They are hearty, quick, fit and have good skills. We felt we could handle them in the forwards, we wondered about the kicking game and in a 20 MPH wind (that was kicking up Sunday AM) we knew that kicking would be an important aspect of the day. I was concerned about our backline defense, that was figuring things out, but was still not where it needed to be. Bomber Academy were tough, but the Tigers were tougher. Running into the wind, the Tigers scored first when Brandon Worley pushed over in the 4th minute. Tigers demonstrated the ability to control the ball in the rucks and gave the backs lots of opportunities to probe for soft points in the BA backline. We had some very nice backline moves on the day and scored in the 12th minute when at the 35th meter, we used the double x… Phil to Jay filling in who draws the wing over and then dishes off to Tez. Looked like I drew it on the board. At the 16th minute Freddy took a try on his wing following some nice ball handling by the line. Freddy had some work to do to get in-goal, but dipped, stepped and took off. They could not catch him. Tigers up 25-5 at the half. The second half was tougher. BA decided to stop playing rugby and start fighting. They were clearly frustrated with their inability to control the game and the frustration was on a consistent rise. Players started taking punches, late hits and other aspects of foul play. I was glad to say that the Tigers kept their cool and protected each other nicely. DC took a players head off who was punching Cobb in the back of the head. (All away from the play and no help from the AR.) Like I said, the lads were doing a nice job of looking after each other. Joshua scored two more tries in the 12th and 27th minute to end the match. Tigers win 37-5 and with it the tournament. We were bruised but not beaten. The wounds feel better when you are holding the gold. The Tigers are collectively very impressed with their accomplishments, and they should be. They have come a long way in two years and are looking for great things going forward. I am very proud of the character that these young men consistently demonstrate. They are a credit to their families, their college and themselves. Whether it is a referee, opposing player or hotel staff they are dealing with, the lads conduct themselves in an exemplary fashion. They consistently demonstrate the values that we cherish… integrity, courage, commitment, leadership, class and poise.